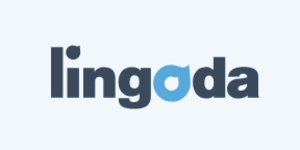 Lingoda is an online language school for German, English, French, and Spanish. Our qualiﬁed teachers are not only exclusively native speakers but they are also committed to providing the best learning experience to students from all over the world. We provide interactive private and group classes, which are all held online via Live-Chat or SkypeTM and are available around the clock, 24/7. As a result, Lingoda's students can learn a new language wherever and wherever they are in the world. All they need is an internet connection and the classes can begin!